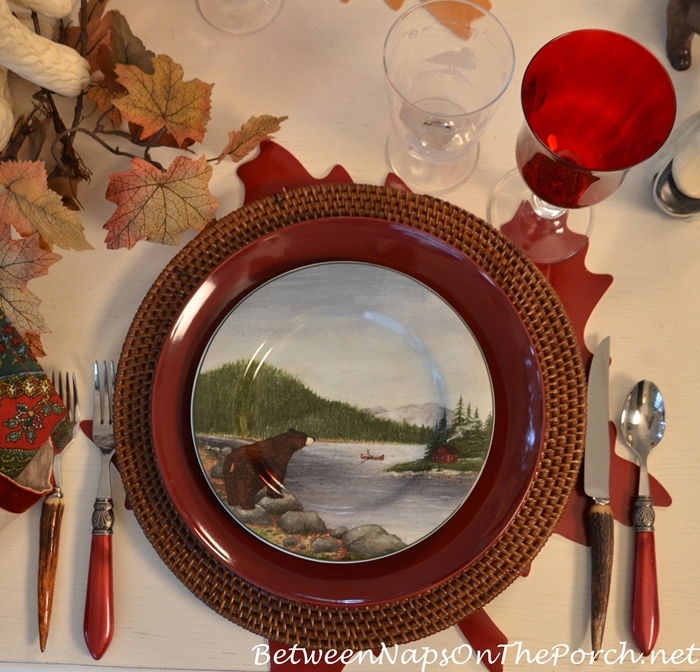 Welcome to the 416th Tablescape Thursday! We’re still having beautiful weather in the 80’s each day, but the table I set for this week has more of an autumn feel. This week’s table was inspired by another beautiful David Carter Brown dish pattern, one I just discovered a few months ago. I’ve never met a DCB design that I didn’t love. He has created so many beautiful scenes that have been turned into enchanting dishware. I wonder if he creates them for the china companies like Sakura or if they adapt the lovely scenes he creates to use on their dishware? Would love to know more about that since his art is so wonderful! 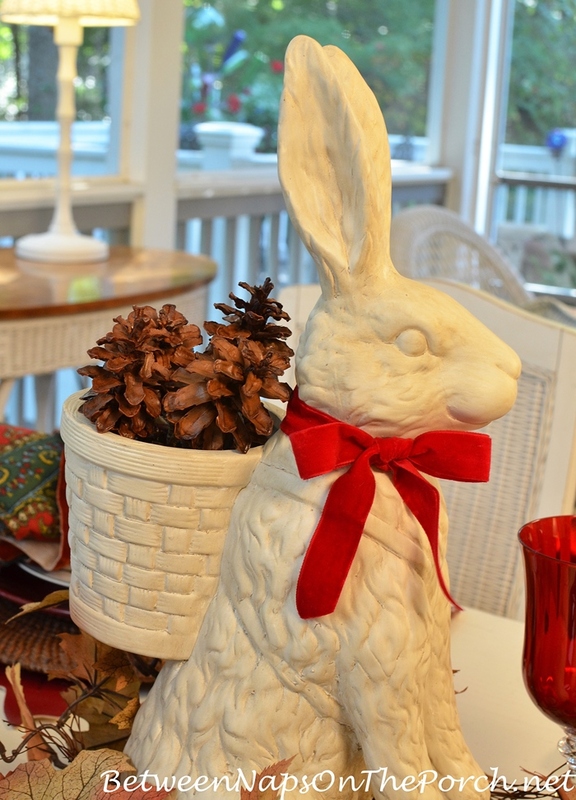 Mr. Bunny wanted to help with this week’s centerpiece. Ummm, what does he have in his basket this time? Oh, it looks like pine cones he’s gathered from the Northwoods Forest! I found the antler flatware many years ago on eBay. It worked well for this week’s woodland inspired table. 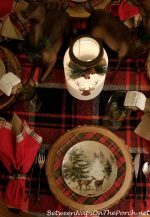 Since the antler flatware only included a knife and fork, I like to mix it with other flatware when using it in a table setting. 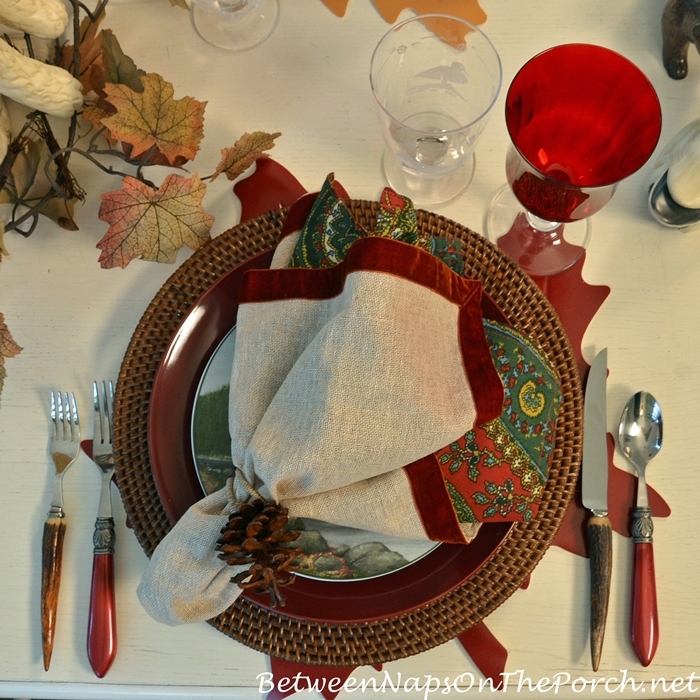 The red flatware is available HERE and you’ll find a previous post where I share a lot of the flatware I use in table settings here: Where Did You Get That Flatware? 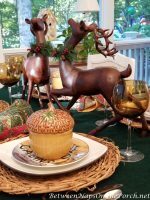 I added an extra layer to each place setting this week, red and gold leaf-shaped placemats are peeking out from under the rattan chargers. (Rattan Chargers are currently on sale and available here: Rattan Chargers.) I think the placemats came from Dollar Tree, but I’ve had them so many years, it’s hard to remember now. 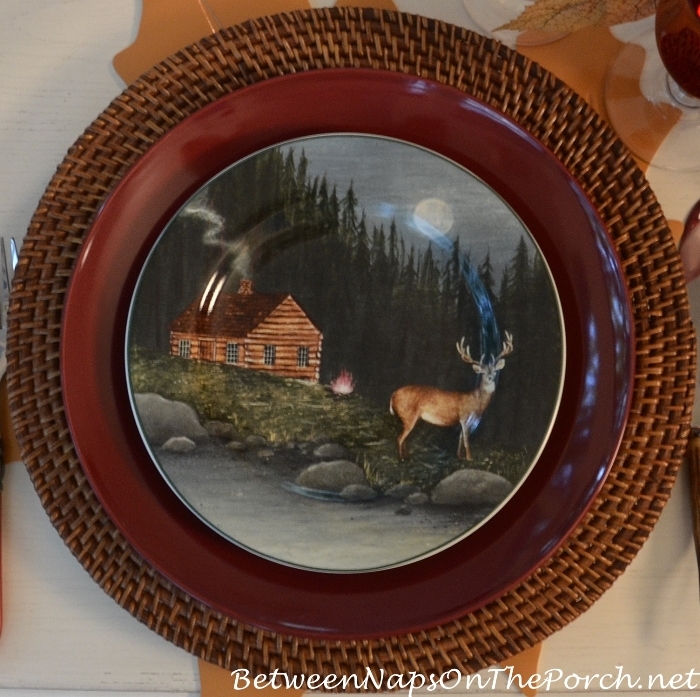 The burgundy dinner plates are from Dollar Tree, if I’m remembering correctly. The salad plates were the inspiration for this week’s table. I absolutely love a woodland theme so was excited to find this delightful pattern by David Carter Brown on eBay. Though I was thinking “autumn” when I created this table, I think this pattern would work really well for a Father’s Day table, especially if it’s for the guy who loves camping, hiking or fishing. It would also be cute used in a birthday table for anyone interested in those pursuits. All four plates depict a different woodland scene. The pattern is called, “Northwoods.” I figured that was just a cute made-up name until I Googled it last night. Turns out, Northwoods is a real place! This plate depicts a guy fly fishing and it looks like he’s caught a big fish. You can see his tent set up on the other side of the river. I’m afraid I could never fish. I’d feel too sorry for the fish and end up throwing them all back in. Lots of woodland animals can be found in the Northwoods Forest including deer and moose. I love this nighttime scene with the log cabin, deer and the moon rising just over the trees. Do you see the little campfire? I guess they have bears in the Northwoods Forest, too! 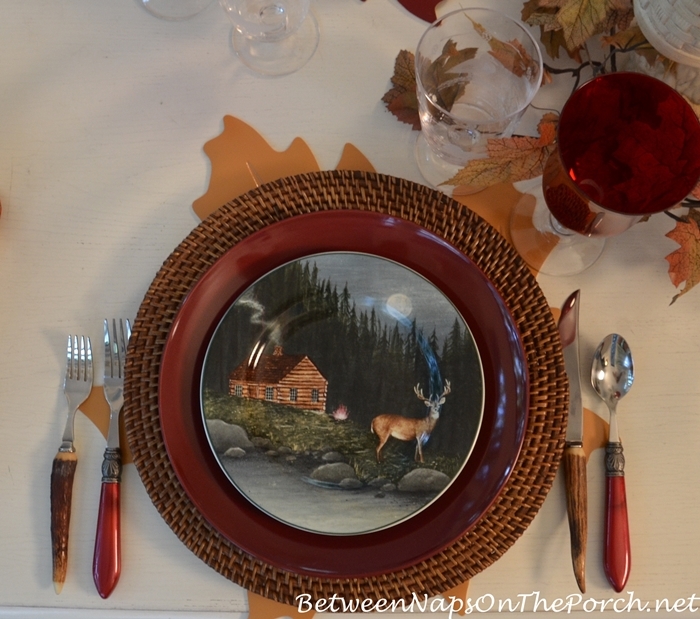 Just love this pattern and the colors make it perfect for an autumn table. Many years ago, probably 5-6 years now, I was visiting a friend in Virginia and we went shopping in a Tuesday Morning. I saw these cute duck glasses and they were marked down to just $1.50 each. 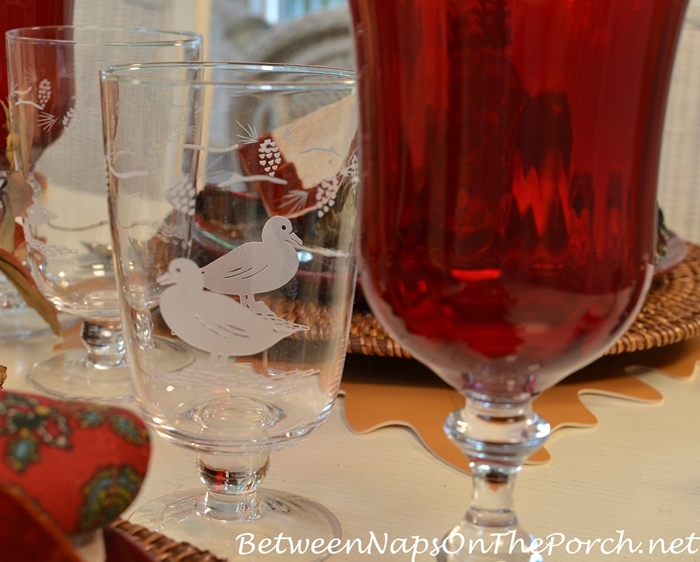 I have them in two glass styles and they depict a duck on each side with a pine cone garland surrounding the top of each glass. They were just what I needed for this week’s table. I’ve found over the years, if you come across a really awesome bargain and it’s something you love, buy it even if you can’t think of how you’re going to use it right then. If you buy what you love, somehow it all comes together and works at some point. 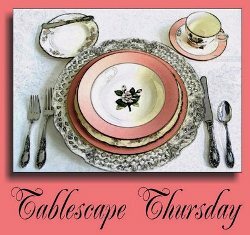 Looking forward to all the wonderful tables linked for this week’s Tablescape Thursday! Those are such richly detailed plates. What a pretty table they make. Susan, the men in my family would love that china pattern. I love it too. I’m going to be on the lookout for a set. Don’t know where I’ll store it if I find a set! All of the elements on your table are perfect with this theme. Can’t believe you got those great tumblers for such a good price. Thank you for hosting. I love this table setting! What a great way to celebrate autumn! Thanks for sharing it. I really enjoy all of your posts. Thanks! Thanks for doing this one! We live here in the Northwoods during the summer where we do see these animals. One day we saw a bear at our front door seemingly about ready to ring the doorbell! Thankfully we still had the window and not the screen in! My husband yelled “bear!” For all of us to come see but I guess he didn’t want to visit after all cause all we saw was his hind end running away! northwest Wisconsin. Love your table settings! I actually like your décor without the chair cushions, the table décor stands out and is so pretty and clean. I cannot imagine the size of your dish closet. You need to do a blog on that, we would love to see how you organize all your various dishes, glasses, flatware and linens. Susan, you did it again. 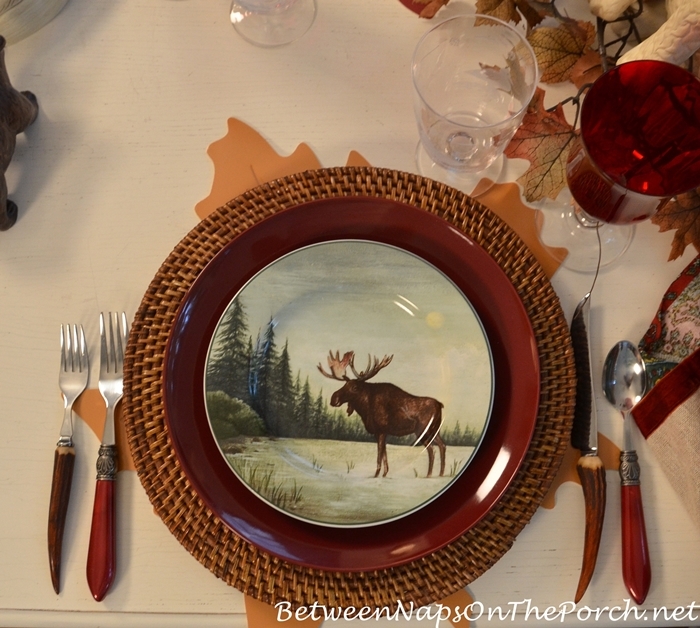 I LOVE this woods inspired tablescape. The Brown dishes are perfect and the glasses — well they couldn’t be better. 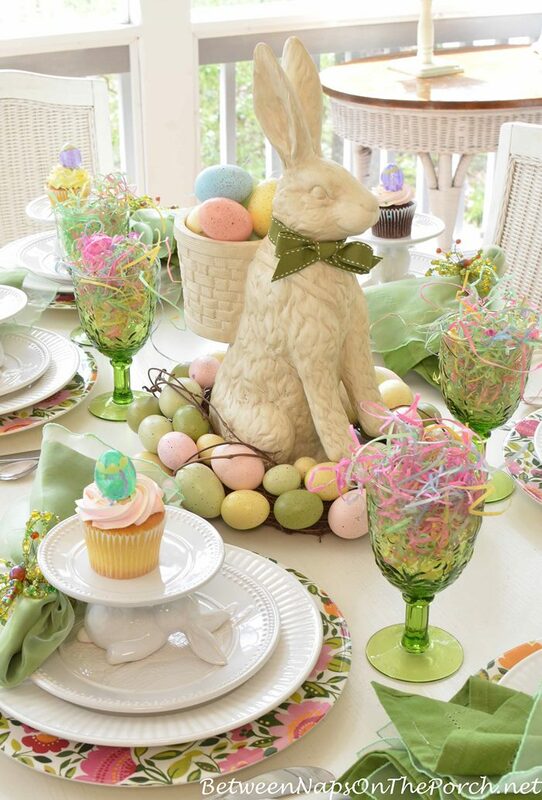 Looking forward to the “Tail of the Bunny” in your tablescapes. Ahh I love the use of the rabbit like this! Great way to get more use out of something usually thought of for another holiday or season. Those a great dishes! We have so many sportsmen that come up here for hunting and fishing so these would be very popular for decorating a cabin or cottage. I still haven’t jumped in on the fall decorating yet. We’re still experiencing pretty warm weather up here even so it’s hard to think about fall just yet. 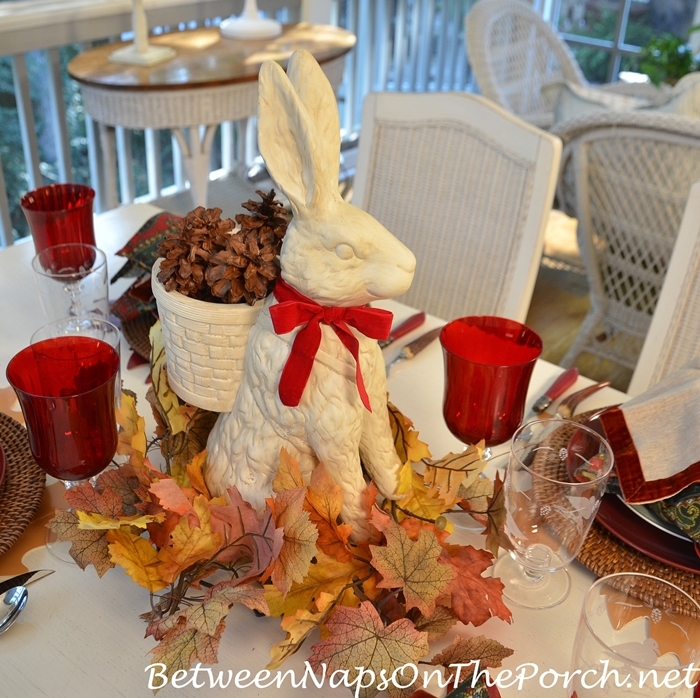 I just love how versatile the elements are in your tablescapes – re-using the bunny for instance! I also have the rattan chargers and use them all year long. I’m so envious of your porch and the beautiful settings that you create. I too collect all kinds of dishes, glasses, etc. and so appreciate your use of items during different seasons. So pretty and creative. 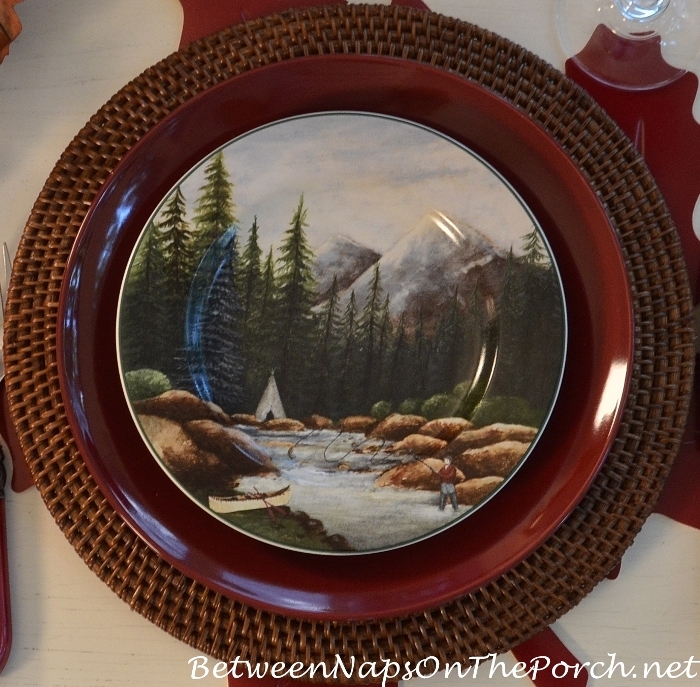 I lived in northern Maine for 4 years, and these DCB plates perfectly capture the North Woods. 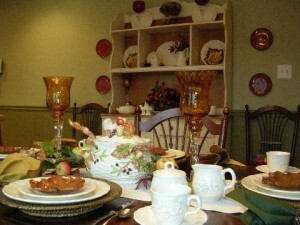 This is a wonderful Autumn tablescape, makes me long for a real autumn (which never really happens in Phoenix Arizona). Mr. Bunny is amazingly adaptable. I think the only time he hasn’t made an appearance is New Year’s Eve; perhaps he needs a top hat and bow tie. 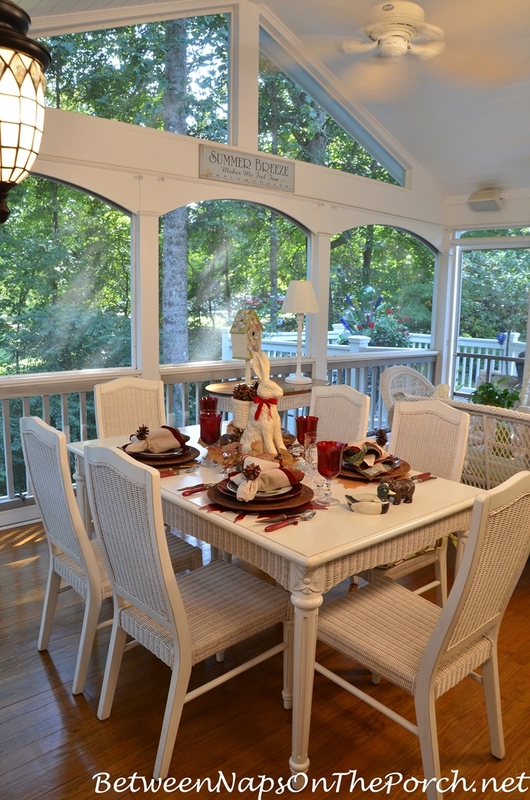 Your table makes autumn a bit more enticing for summer people. But I especially appreciate the suggestions for other occasions. I wouldn’t have thought beyond fall. I have always wished I had a cabin in the woods to decorate. 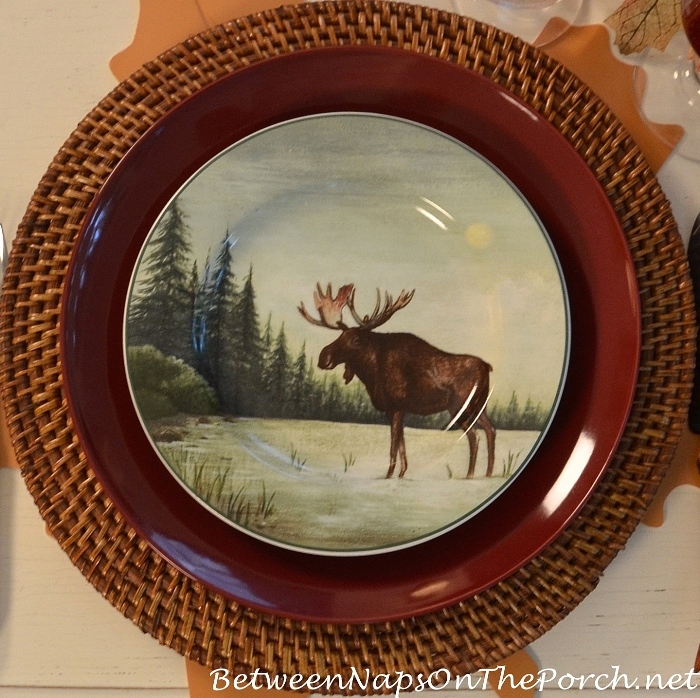 I LOVE these plates, Susan and the glasses are perfect! What a beautiful table!! Thanks for hosting! 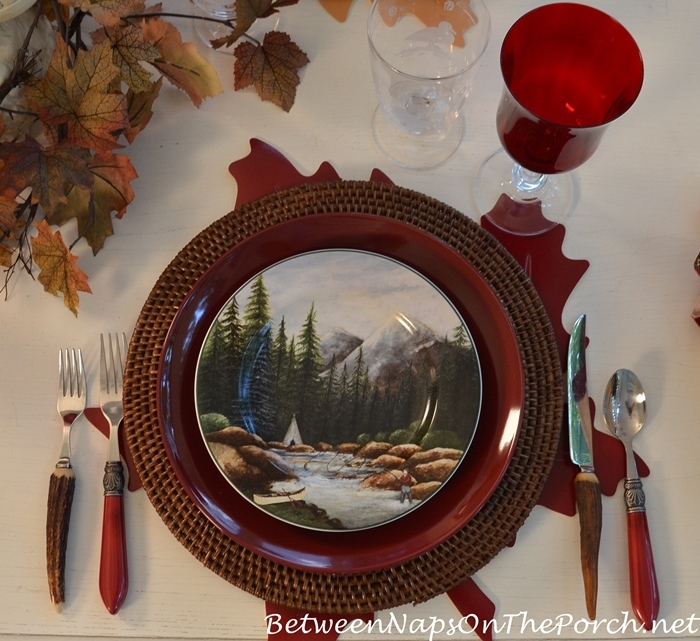 If I could get a little reprieve in the weather here, maybe I could get a little more excited about fall and wonderful tablescapes like yours today. 80s, really? Could it possibly be hotter here in WV?! We’ve had nothing but 90s since our return home last week, and the only saving grace has been cooler mornings – until around 9am. I was sweatin’ like a pig yesterday at the farmer’s market trying to pick out a pumpkin so I could get into the spirit, but it was exhausting in the heat. I’m afraid the one I bought is going to rot, lol. At least your visuals can trigger the season in my thoughts, and thank you for that. Love your new DCB plates. 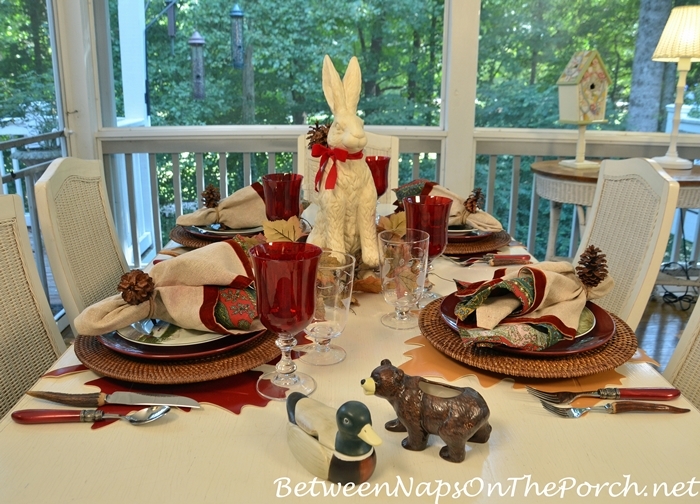 You made me laugh as soon as the blog started opening because Mr. Rabbits ears were all I could see, but I knew you had another lovely table with an out doors theme. Lovely. 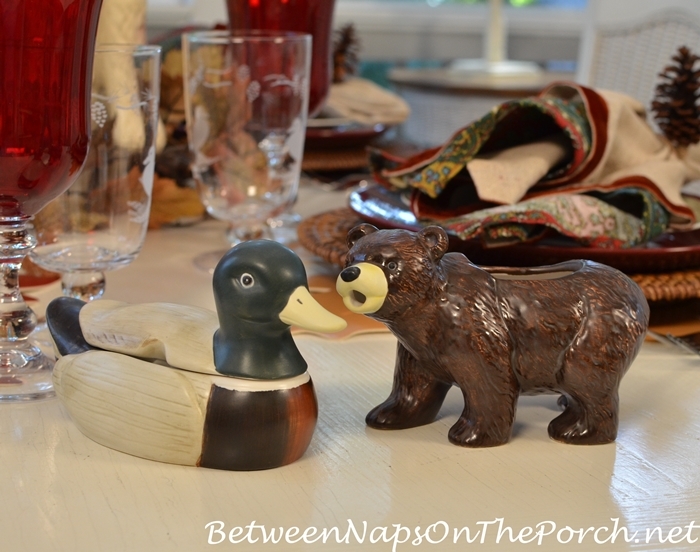 I left somethings at HomeGood’s yesterday and now I wish I had them, but I had purchased so much. Maybe they will still have them next week. Also., I really didn’t think of how I would use them. 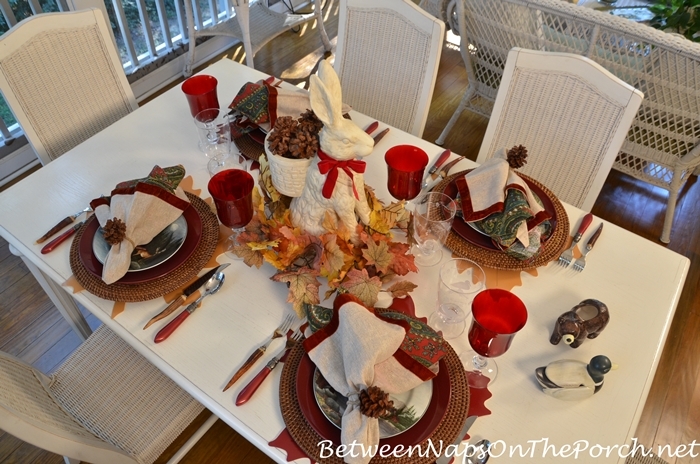 Thank you so much for hosting Tablescape Thursday. It is so much fun to be a part of. 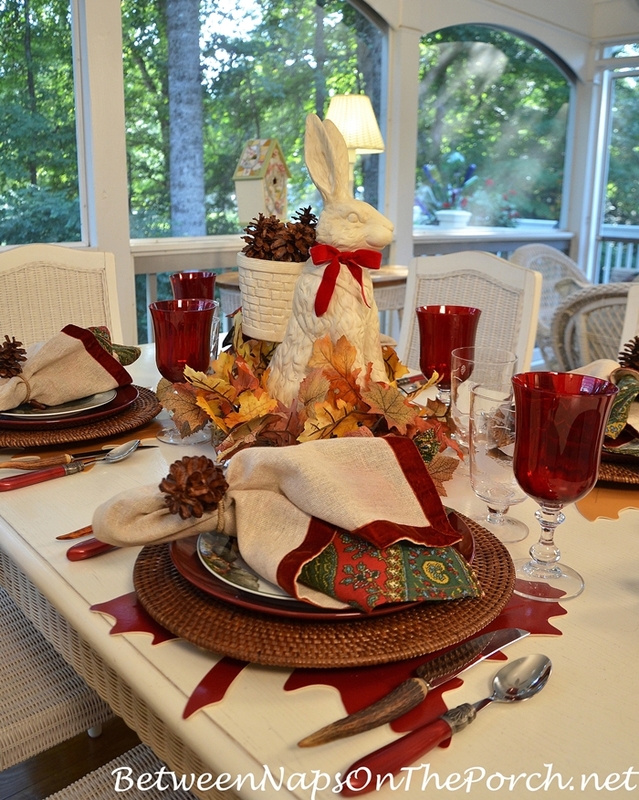 Your Fall Tablescape is gorgeous. I always look forward to your beautiful tablescapes! I hope that you have a wonderful weekend!!! I am glad you have found an assistant to help you with your pine cones and other wonderful displays he sure is a cutie. Love those plates, have a great day. An amazing table. I love how you use the rabbit for all seasons. Thanks for everything. I love the colors in the dishes just beautiful. The creamer and sugar is so cute. This table is so autumn I love it. 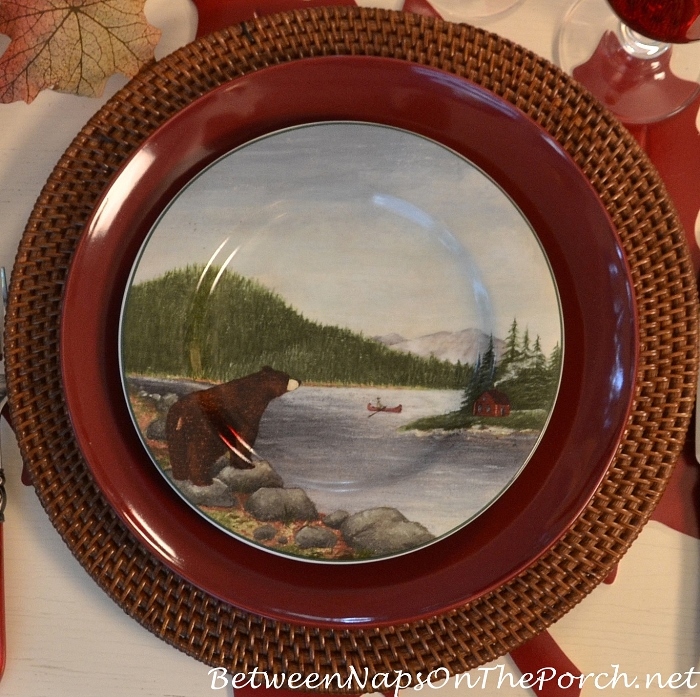 Lovely table setting…had me dreaming of sitting on a lake cabin porch sipping tea, watching wildlife on a beautiful autumn day. Thank you for hosting! Always a pleasure to see the inspiration! 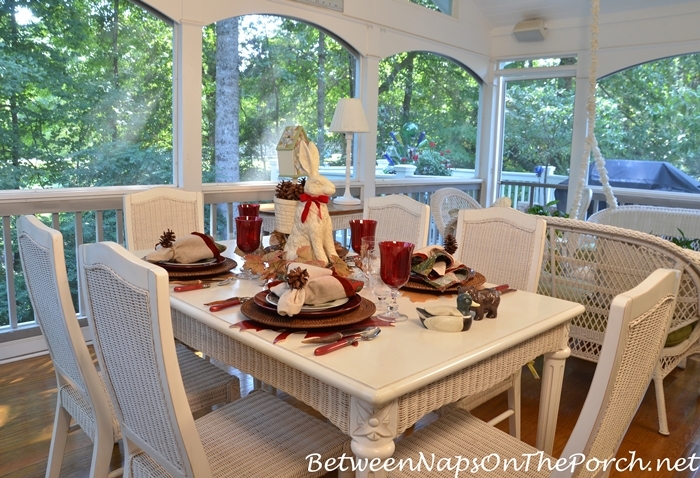 Susan, I found your blogs about 4 or 5 weeks ago and enjoy seeing your tablescapes. I am also a dish lover. I just wanted to let you know that Williams-Sonoma has their tartan plaid chargers out now, I just ordered mine. I thought some others may want to order. It is free shipping now. Thanks, Elinda! I’m so glad you were able to get some…love that tartan design! I know you have the chargers. Do you have the dinner plates and salad plates as well ? And I use the tartan plates with other patterns and chargers as seen in this post: Tartan Dishware The pictures are way too dark in that post, but hopefully it will give you an idea how I use them. And I think that I have dishes!! I have taken to keeping them under my couch now. It has a skirt and hides them. Beds have dishes under them too. My family thinks it’s a sickness! Well I guess I need to keep the rabbit in the house instead of putting him in storage with the spring boxes. Thank you for showing me another way to use him. Rabbits do hop all throughout the year. not just easter.